HE Shell305 mm Spr.Gr. L/3.8 Bdz. HE Shell305 mm Spr.Gr. L/4.8 Kz. Initial HE Shell Velocity855 m./s. 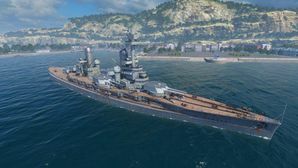 Kaiser — German Tier IV battleship. In terms of armor thickness the ship was superior to all battleships of her time. Driven by turbine propulsion, this battleship had a decent speed for her type. The main battery's armor-piercing capabilities were highly competitive with the artillery of super dreadnoughts from that era. The biggest problems with the Kaiser dictate how it should be played. Yes, the Kaiser has fairly rapid firing guns as battleships goes, a powerful secondary armament, a tight turning circle, and good armor. Despite these attributes though, she's not particularly effective as a brawling battleship as she suffers from inaccurate guns, very slow turret traverse and slow rudder shift time. It's better to use her as a mid-range (8-10km) fighter supported by cruisers and other battleships, which would give one sufficient range to avoid torpedoes launched by cruisers, but also be close enough to make up for the inaccuracy of her guns. Torpedoes and aircraft are going to be a problem in this ship, as are changing targets. The small turning circle of the Kaiser can be useful in making sharp course changes, say if a player needs to quickly get out of an area, but her slow turret traverse means it is an utter pain to try to aim your guns while performing sharp turns. This isn't helped by the slow rudder shift time. Situational awareness of possible destroyer locations and approaching aircraft is critical in this warship as failing to do so otherwise will get a player killed. Fast loading guns: your main battery is second only to Ishizuchi in Battleship reload speed at this tier. Kaiser's B hull upgrade should be your first priority in research. The B hull provides a welcome increase to your health pool as well as reducing your rudders shift time, making her more responsive to your rudder input and more maneuverable. Another benefit is the large improvement to your AA batteries, making her at least able of shooting down some attacking planes. The Fire Control System upgrade should follow. Finally, you can research the Propulsion upgrade for a marginal improvement to your speed. As a Tier IV ship, Kaiser has access to Slots 1 and 2 for upgrades. Slot 1: Main Armaments Modification 1 ( ) to improve the survival of her main guns. Kaiser's full broadside is tricky to set up due to the off-axis turrets. Kaiser suffers two waves of enemy torpedo bombers after being set on fire by enemy dive bombers. SMS Kaiser was the lead ship of the Kaiser class of battleships of the Imperial German Navy. Kaiser was built by the Imperial Dockyard at Kiel, launched on 22 March 1911 and commissioned on 1 August 1912. The ship was equipped with ten 30.5-centimeter (12.0 in) guns in five twin turrets, and had a top speed of 23.4 knots (43.3 km/h; 26.9 mph). Kaiser was assigned to the III Squadron of the High Seas Fleet for the majority of World War I. In 1913, Kaiser and her sister König Albert conducted a cruise to South America and South Africa. The ship participated in most of the major fleet operations during the war. She fought at the Battle of Jutland on 31 May – 1 June 1916, during which she was hit once and suffered negligible damage. The ship was also present during Operation Albion in the Baltic Sea in September and October 1917, and at the Second Battle of Heligoland Bight in November 1917. During peace negotiations after the end of the war in 1918, she was interned with other ships of the High Seas Fleet at Scapa Flow. On 21 June 1919 the commander of the interned fleet, Rear Admiral Ludwig von Reuter, ordered the fleet to be scuttled to ensure that the British would not be able to seize the ships. The wreck was subsequently raised in 1929 and broken up in Rosyth in 1930. Both of the Kaiser's hull modules are fictitious. The ship was never fitted with funnel caps and additional anti-aircraft armament. See König Albert for the historical version. Only saw service with the Imperial German Navy, yet it flies the Kriegsmarine flag of Nazi Germany. This page was last modified on 18 August 2018, at 21:32.